When location is Non-ASCII Character, map is not loaded. I found this problem, when I made my meeting on Meeting Application. If I specify location as Korean, Map is not loaded. and If I specify location as English, Map is loaded. Because Meeting Application uses Map macro, I checked and modified Map macro. And this problem is solved. 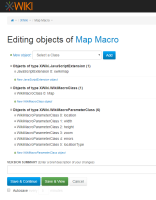 I modified XWiki.WikiMacroClass of Map Macro. This is a problem that user can fix by himself, but I hope the fix for this problem is reflected in the project.